This Census Campaign is run by the British Humanist Association. 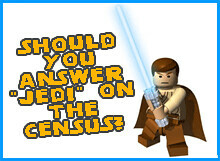 The Census Campaign wants non-religious people to tick “No religion” in the 2011 Census. We want people to know why the question on religion is flawed and why so many non-religious people didn’t tick “None” in the 2001 Census. We want people to know that real decisions on resource allocation and policy are based on Census data and if it’s wrong then we all stand to lose out. This website is maintained by the British Humanist Association. Advertising mock-ups are based on original photographs available for derivative works under Attribution-only Creative Commons licenses. Thank you to JustGiving.com who host our donations page.